RUSH: Oh. This is gold, too, and I just printed it. Here it is. You can’t explain this. This is a Politico story, and the headline, “Democratic Lawmaker: Women’s Clothing an ‘Invitation’ to Harassment — Rep. Marcy Kaptur (D-Ohio) made the comments during a private Democratic Caucus meeting Wednesday to discuss sexual harassment issues, according to two Democratic sources in the room. 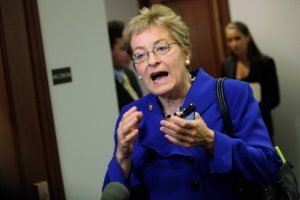 ‘I saw a member yesterday with her cleavage so deep it was down to the floor,’ Kaptur said, according to the sources present. ‘And what I’ve seen … it’s really an invitation.’ The comments left many others in the room stunned, the sources said. “Kaptur said women on Capitol Hill should have to abide by a stricter dress code, like those adopted by the military or corporations. ‘Maybe I’ll get booed for saying this, but many companies and the military [have] a dress code,’ she said. ‘I have been appalled at some of the dress of … members and staff. Men have to wear ties and suits,'” and these women’s cleavage is all the way down to the floor. Marcy Kaptur, in the midst of the greatest Democrat stratagem yet. Every man is a sexual harasser and every woman is a victim! Amidst all of these guilty Democrats being forced to resign, like Al Franken and Weinstein, all of them, the Democrat Party forcing them out so that they can have a clear run at Donald Trump on the same thing. And now here comes Marcy Kaptur overheard in a private Democrat caucus meeting blaming the women! Now, you know what’s gonna happen. She’s gonna deny this. She’s gonna say the sources are making it up, they’re out to get her, she would never say this, that she’s on the right side of this issue, but this is The Politico. This is not a so-called conservative site. Misconduct is a new word in this now. It was harassment, sexual harassment. Then it became sexual abuse. Now it’s sexual misconduct. I mean, that opens wide the door where you can classify anything sexual as misconduct. I mean, harassment, that’s a pretty high bar, abuse is a high bar, but misconduct? That could be looking the wrong way. (interruption) Who? No, she’s not the first — I’ve been asked by the program observer if I think somebody will be brave enough to say she has a point. The last woman that tried to say this, Donna Karan, she said this in the midst of the Weinstein thing, and it took, what, three minutes for her to start begging everybody’s forgiveness. They ran her out of business. No more Donna Karan on the red carpets. No more Donna Karan on the models if she didn’t get her mind right on this. There was one other woman that also blamed it on women or said that women can bring this on by the way they dress. There was one other woman and they ran her out of wherever she was. So who do you think is gonna say she has a point? Roy Moore? Al Franken (imitating Franken), “You know, Marcy Kaptur has a point here.” I mean, who’s gonna say it? Who are you thinking is gonna say she’s got a point? Snerdley, you’re holding out hope that common sense is gonna rear its head in this. We’re smack-dab in the middle of the what the Democrats think is one of the most successful weaponized political strategies they’ve ever devised. They’re not gonna allow common sense to come in here and obliterate it. You think there’s gonna be a Democrat out there that would ever confer, “You know, Ms. Kaptur has a point. Women can be responsible for what happens to them by virtue of the way they dress.” There’s somebody besides Donna Karan that did this too, another relatively well known women, maybe an actress, somebody. There have been two or three of them that said this, and they have been shunned, they have been warned, they have been threatened, and they immediately apologized. None of them stuck with it. By the way, there’s another damning text. Lisa Page and Strzok. Lisa Page basically told Strzok that he needed to save the country from Trump. “Maybe you’re meant to stay where you are because you’re meant to protect the country from that menace,” she wrote. “I can protect our country at many levels,” Strzok replied. This strategy, these two are discussing all of this with Andrew McCabe, who was Strzok’s boss and Lisa Page was McCabe’s assistant. This is in the second in command in the FBI where they’re strategizing all of this. Angela Lansbury is who I’m thinking of. Who did she play? Not Miss Marple. She played — what was the character? Sunday night — no, no, no. Murder, She Wrote was the show, right. I play golf with her son. Funny guy. Great, fabulous guy. Directed many of the episodes. It was a family affair. His name is Anthony. But she came out, she said this, and she didn’t walk it back as quickly and as rapidly as some of the others or as Kaptur’s. Marcy Kaptur has to say, “No. They misunderstood. I never said that.” Because these are unnamed sources. This is made to order for CNN. Unnamed sources, Marcy Kaptur can say she didn’t say it, this is a Republican trick, except that it’s in The Politico. But the Republicans leak to Politico.